This article describes how to understand the schedules and complete your observation forms and action plans. When you first log into Observe you are introduced to your own personal dashboard. As seen below; as an Observer you will see all the Observees assigned to you. If you are also a practitioner who will be observed yourself, you will also notice a My Assessments section. 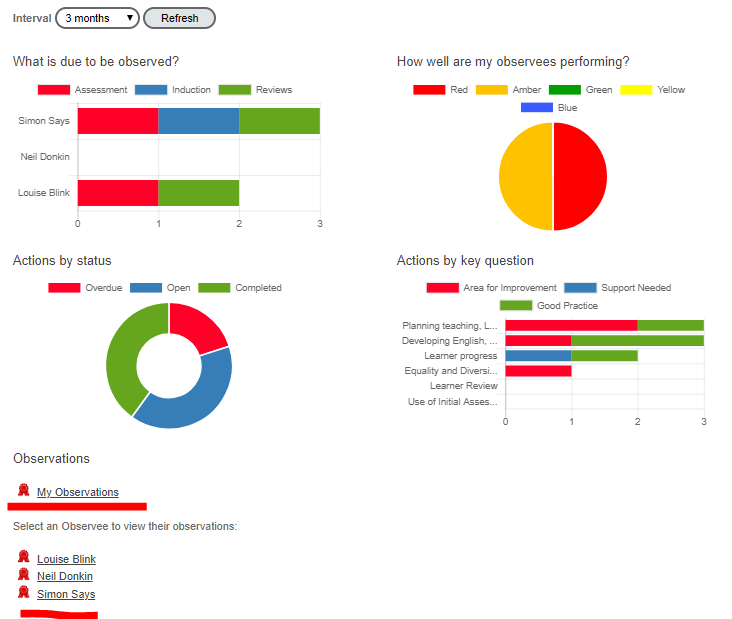 Where Observers want to see an individual Observees dashboard simply click on their name. Once you have clicked on an individual you will notice the dashboard has changed. This page will also include what has been scheduled and completed for this individual. Your administrator will have assigned a sampling profile to this individual. This also assigns the correct template so that when you click on the 'New Assessment' icon they become forms for you to complete. You can access the form in two ways. Either the small 'New Assessments icon in the scheduled table or the larger one at the top of the page. 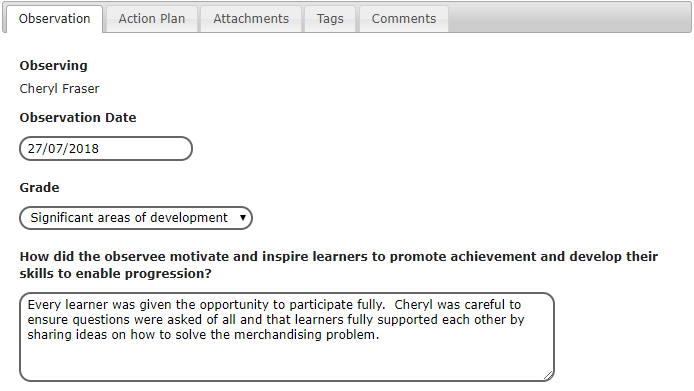 You are also able to create an action plan for your Observee by click in the 'Action Plan tab and the 'New Action' icon. You can upload files or link the observation to a file in the Store module. The comments tab provides a space for your observees to note their reflective and line managers can contribute by leaving their comments. If you have any further questions please don not hesitate to use your online chat.